By conventional measures, the Garthwaite Center for Science and Art is as green as buildings get. The Cambridge School of Weston facility, in suburban Boston, maximizes natural lighting, uses renewable energy and discharges zero sewer water, for starters. As designed by Architerra, Inc., the Garthwaite Center snagged a top "platinum" rating from the U.S. Green Building Council. And the American Institute of Architects ranks it among 2008's 10 best green projects. Bob Bingham is underwhelmed. 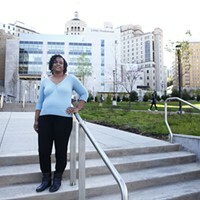 "They got a big award for it being the greenest building in the United States [sic] -- but look at it," says the internationally exhibited Pittsburgh-based artist. Indeed, seen in an aerial photo, the Garthwaite is, literally, rather less green than its wooded surroundings. One might even call it "stark white." The satellite photo from Google Earth is part of "The New R5 Travel Agency: Roving Roof Revision Request Robot," Bingham's contribution to the Mattress Factory museum show Meet the Made. Adjacent is posted an image of the 22,000-square-foot Garthwaite as greenly amended in PhotoShop. Instead of a white roof sporting a mere soul-patch of sedum, Bingham's version is fully bearded with perennial meadow: sedum and prairie grasses, with wildflowers like yarrow and black-eyed Susan. There are even some fruit trees, plus a patio amidst herb and vegetable gardens. Bingham has long made art about built and natural environments, and "R5" stretches both this show's robotics theme and the definition of "travel" to his ends. The interactive exhibit encourages visitors to pick any structure anywhere -- from their own houses to the White House -- and suggest a greening strategy. Bingham's assistants, Claire Hoch and Jescha Chen, PhotoShop the design using Google Earth or Google Maps Street View, then e-mail the result to the participant. 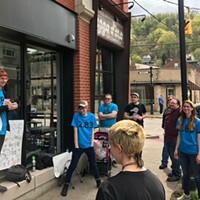 Bingham has been a booming-voiced, pony-tailed fixture on the local scene since he helped found the South Side's Brew House art collective, in the early '80s. He greens buildings in real life, too: At Carnegie Mellon University, where he teaches, landmark Hammerschlag Hall's green roof was planted thanks largely to his efforts. "R5," though, is about possibilities. In some parts of Germany and Switzerland, Bingham says, new buildings must recreate, on their roofs, whatever natural "footprints" they displace. "You're camouflaging it back into the environment," he says. The idea of imaging the imaginary grew from Bingham's days as an architecture student studying renderings. "I know the power of making it look official," he says. Staff hours at "R5" are minimal (currently, 2-4 p.m. Sundays), but a few dozen visitors have filed requests. One suggests outfitting a Shadyside house's roof with mango trees and a stream. Another wants the Arc de Triomphe planted with pumpkins and garlic, a tree house and a "waterfall???" -- plus a wind turbine and solar panels. "Here's somebody who wants desert plants," says Bingham, reading one request form like some architectural eco-Claus. Beyond aesthetics, green roofs preserve animal habitat, retain stormwater and -- by providing both shade and insulation -- lower heating and cooling costs. The "R5" waiting area stocks books including Green Roofs, by the group Earth Pledge, featuring dozens of examples including Chicago City Hall, Ford's huge River Rouge Plant, in Michigan ... and downtown Pittsburgh's Heinz 57 building. Meanwhile, at Bingham's own North Point Breeze home, an exterior latticework of trumpet vine creates shade. Plus, he adds, "We have hummingbirds just surrounding our house." Green roofs, Bingham acknowledges, are twice as expensive as conventional, and not all structures can bear the weight of root barriers, soil and plants. But such roofs last twice as long, and help pay for themselves in energy savings. It's the kind of big-picture thinking artists are especially suited to bring to the environmental table. "A lot of it's visioning, getting people to look at the world differently than we normally do," says Bingham. "I like at least getting people to think about it -- planting the seed in their brain." 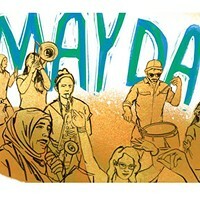 Photo illustration courtesy of Claire Hoch. 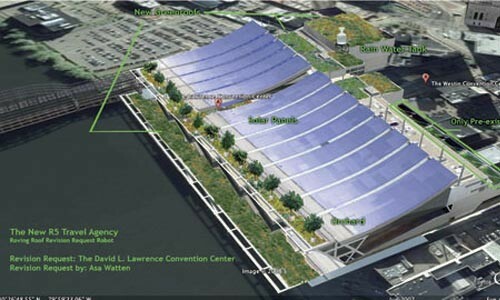 One "R5" visitor requested a David L. Lawrence Convention Center with solar panels and more green roofing.